In a room in Rollins School of Public Health, about 50 Emory employees sit quietly. The only sounds are the gentle voice of their instructor and peaceful breathing, interrupted occasionally by muffled noise from a nearby conference room. In that conference room, no doubt, employees are hard at work on projects and deadlines. But here, for an hour, participants are learning to focus inward. As students in "Mindfulness Meditation 101," they are learning how to use meditation to relieve stress and improve their physical, mental and spiritual health. Held in the busy last week of the fall semester, the introductory information session was conducted by Sue Matthews, part-time psychologist with the Faculty Staff Assistance Program, as part of FSAP's "Success with Stress" workshop series. The idea was to learn how to concentrate on the breath and notice what is happening in the moment, but not feel pressure to do anything about it. "I struggled to cancel out the voices but realized I had to accept them." "I found it easier to do this in a group than by myself." Matthews explains that meditation, like any new skill, requires repetition. "If you practice it, you will get better," she says. "You'll find you can get it when you need it." Luckily, Emory staff, faculty and students have many opportunities to practice meditation on campus. Due to the high registration for December's workshop, FSAP plans to offer the class again in early 2016, this time at an Emory Healthcare location. "We have received increased requests for mindfulness workshops over the past few years, and as research continues to highlight the benefits of meditation, we are incorporating mindfulness into more of our programming," says Robin Huskey, manager of education and outreach at FSAP, noting that they have also offered a "Mindfulness for Caregivers" workshop as part of the Emory Caregiver Wellness Workshop Series, co-sponsored with the Emory WorkLife Resource Center. There are multiple meditation groups meeting across the university, with opportunities available every day in locations ranging from Cannon Chapel to the School of Medicine. The Emory Collaborative for Contemplative Studies maintains a list of meditation options, while the Emory-Tibet Partnership offers more in-depth opportunities for cognitively-based compassion training (CBCT), which also draws on meditative practices. Both allow practitioners to experience "a restorative break," notes Bobbi Patterson, professor of pedagogy and a longtime participant and instructor in meditation. "Science is catching up to what religious communities hypothesized, experimented with, and learned: stilling the mind for compassion is fruitful for self, others, all living beings," Patterson explains. Mindfulness meditation focuses on being present in the moment and aware of one's own thoughts and feelings, without judging them to be good or bad. A growing body of research supports the use of mindfulness to benefit physical and mental health. Cognitive-based compassion training includes elements of mindfulness, with a specific focus on relationships with other people. Emory studies have shown that a CBCT protocol developed by Geshe Lobsang Tenzin Negi, director of the Emory-Tibet Partnership, can significantly increase the ability to interpret other people's facial expressions, leading to increased empathy, and that it can reduce emotional distress and improve resilience for both healthy young adults and high-risk adolescents. "Training in compassion begins with stilling the mind through keeping the attention in the present moment — following the breath, for example," says Timothy Harrison, CBCT assistant director for the Emory-Tibet Partnership. "Such practices improve our ability to maintain attention on one thing and not have it drawn off by endless distractions," Harrison continues. "From this more stable and calm state, we can expand our compassion by directing attention to the important truths that we tend to forget in the daily hustle and bustle of life, such as the common humanity we share with others, or the fact that our own well-being is deeply dependent on the well-being of others." A variety of free options for meditation are available on the Emory campus each week, with some focused mainly on mindfulness and others incorporating elements of CBCT. Drop-ins and beginners are welcome for these ongoing groups, which are open to anyone in the university community. Free and open to everyone, this meditation gathering started 10 years ago as a control group for a study, says Patterson, who leads it and was one of CBCT's first certified teachers. The group practices for 30-45 minutes, followed by a short discussion. "We're an 'all comers' group — including everyone from first year students, to staff, to administrators, to grad students, to faculty and community members," she says. These weekly sessions provide meditation instruction for individuals at all levels of experience. Coordinators facilitate dialogue about meditation practice and the incorporation of mindfulness into everyday life, and you do not have to be a graduate student to participate. "We now generally offer three to four daylong sessions throughout the year and one or two overnight residential retreats, as well as periodically screen meditation-related films," says Amanda Brown, one of the coordinators. Self-guided meditation, Mondays, 8-9 a.m.
Group meetings, Thursdays, 6 p.m. The Emory Buddhist Club welcomes students, faculty, staff and friends for meditation instruction and practice. The club, led by Emory Hsu, hosted guided meditation led by experienced teachers 48 times during 2015 on the Emory campus, plus twice at Oxford College. "Our goal is not to convert people to Buddhism," Hsu notes. "We aim to bring diversity to our university, to expose students to different cultures and viewpoints, to foster an appreciation for healthy contemplation — through meditation and universal practices of tolerance, contentment and compassion." Meditation space, weekdays, 12-1 p.m. Guided meditation, Wednesdays, 12:15-12:45 p.m. The daily meditation space is available Monday through Friday. Each Wednesday, a visiting instructor from the Emory-Tibet Partnership's CBCT program attends and leads a guided introduction to meditation basics. In addition to ongoing groups that are open to all, meditation and Cognitively Based Compassion Training are featured in several other Emory classes and programs. 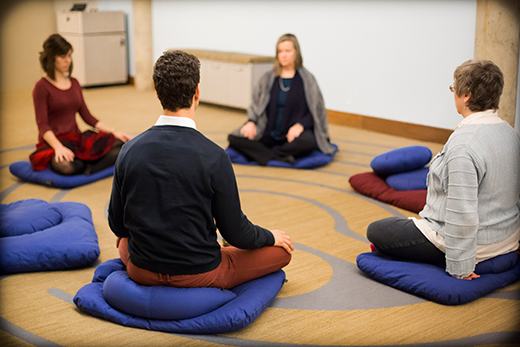 Emory's Counseling & Psychological Services (CAPS) incorporates mindfulness meditation into a number of its programs for students, including a stress management clinic and the "Act on Anxiety" and "Emotional Fitness" groups, according to Wanda Collins, assistant vice president and director of CAPS. The Emory-Tibet Partnership provides CBCT classes for medical students, faculty and staff each semester, Harrison says. And in collaboration with the Carlos Museum and CAPS, CBCT is offered free to students each term at museum. Also, at the Marcus Autism Center, CBCT is offered regularly to faculty, staff, and parents of autistic children. Meanwhile, Spiritual Health plans to begin offering meditation opportunities this year focused on patients, family members and Emory Healthcare staff at all Emory Healthcare facilities, according to Eloise L. Reid, administrative manager, Spiritual Health Administration. Finally, Emory's annual Tibet Week, held in March, features daily meditations led by CBCT-certified teachers, and the 2016 celebration will include a special four-part mediation series led by Negi. "You don't have to change your belief system to cultivate a more stable mind and a more generous sense of compassion," Harrison says. "Caring for others, with less prejudice, is a human capability valued by all major faith traditions. And science is finding that being compassionate fosters mental and physical health. "We all have the seeds of compassion, but it takes thoughtful and sustained effort to cultivate and expand this compassion throughout one's life. Meditation is one way to do that."